The Durban University of Technology’s (DUT) Centre for Excellence in Learning and Teaching (CELT) held its Integrated Institution-Wide First Year Student Experience launch (FYSE) at the Fred Crookes Sports Centre on 31 May 2018. The FYSE programme introduces the first year students to DUT and its facilities that are designed to help and guide students to a better and safer student experience in University. The FYSE programme is also planned to make the life of a student easier on and off campus by providing facilities such as the Student Counselling and Health, the Writing Centre facilities and the usage of the DUT online system. Some of the speakers included Professor Livingstone Makondo, Siphephelo Mthembu, Advocate Robin Sewlal, Kabelo Mabelane, Lisanne Lazarus and Masiza Ngculu. DUT’s CELT coordinator, Professor Makondo addressed the students on the FYSE programme and what they can expect from it. “The First Year Student Experience is not a single programme, but it is a structured initiative that helps students graduate in time. For instance, University writing skills are different from high school and FYSE has seminars and digital literacies to assist you. Students are very lucky to have this programme, we did not have that in our time as students at University,” he said. The launch included video clips from DUT students speaking about their first year experiences, the library services, Writing Centre, live game shows and entertainment by Malic and Ayanda Manqele. 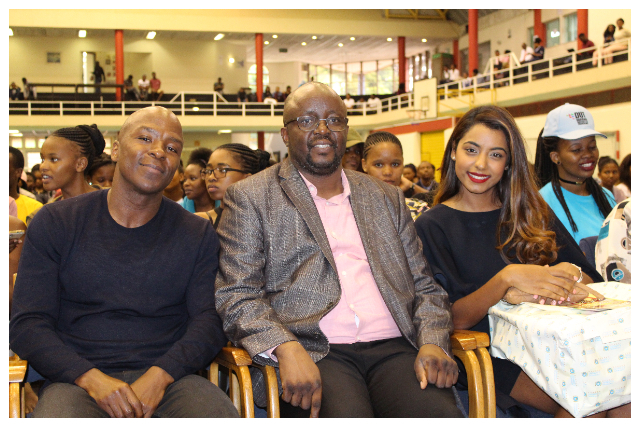 South African Kwaito musician, writer and TV host, Kabelo Mabelane, was also on hand to motivated the students. He shared his life story about the challenges of being a recovered drug addict , who has been clean for 16 years. “People often said to me ‘a leopard cannot change its spots’, I told you I was a drug addict and when I went to rehab the media said I was just trying a publicity stunt and tomorrow I would be back on drugs because a leopard cannot change its spots. That is absolute rubbish because you can change. If you want to get better marks, you can get better marks but if you can’t get better marks, it really means you don’t want to get better marks. It’s really that simple, if you want to be the best in whatever it is, you can be and if you can’t, it means you don’t want it bad enough,” he said. The FYSE staff and facilitators encourage all students to make the most out of the available facilities provided to enhance their University experience. FYSE is available in all DUT campuses, assisting all DUT students. Pictured: Kabelo Mabelane, Professor Livingstone Makondo and Lisanne Lazarus, at the event.